Wilbur (1867-1912) and Orville Wright (1871-1948), the "Wright Brothers," invented the world's first practical airplane. They were born and raised in Dayton, Ohio. Their father was a bishop. From an early age both of them showed an interest in flight, often sitting on the beach and observing birds as they dreamed of someday flying themselves. On December 17, 1903, in Kitty Hawk, North Carolina, the brothers conducted the first truly successful flight of heavier than air, powered aircraft in history. This first flight of the "Wright Flyer", completed by Orville Wright, was at an altitude of 12 ft and had a distance of 120 ft. The government had funded a program to produce flight, a program that was directed by Smithsonian director Samuel Langley. Langley's flight, the Aerodrome, crashed twice in early 1903. Langley nonetheless claimed that he had built the first aircraft capable of flight, which triggered a feud between Langley and the Wright Brothers. 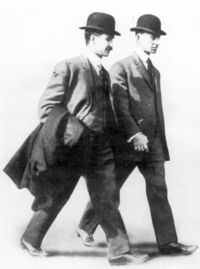 The Wright Brothers did not widely publicize their success for the first few years out of concern that their aircraft designs were being taken. This page was last modified on 27 June 2016, at 20:45.